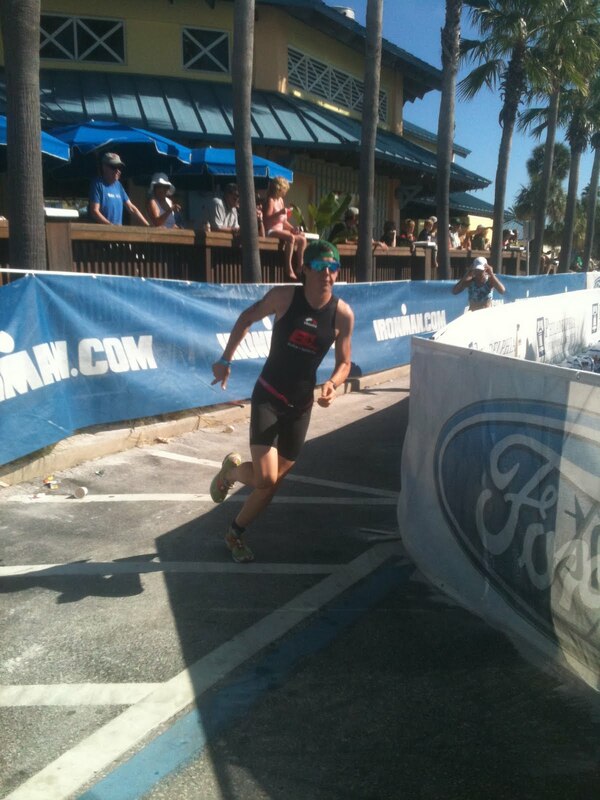 Now that I'm back home and have had plenty of time to reflect on my race last Saturday in Clearwater, I've concluded what went well and what went really wrong. First off, before I start dogging myself, I'd like to thank my family and friends for supporting me and God for providing the ability to compete in such a huge race and to even do this crazy sport. Ok.. Race day, I woke up before my alarm went off (rare) feeling excited and ready to get this day started. I had such a good feeling leading up to Saturday, almost like nothing could go wrong. I ate a somewhat small breakfast (still being full from the pizza I downed the night before) and headed out to the transition. Luckily some dude with a golf cart gave me a ride down to the start (roughly little over a half mile away), which was nice because I didn't need to be on my feet anymore than necessary. After the usual pre race bike check, I chilled out for 2+ hours on the beach listening to my ipod. My start wave, 29 and under, started last at 8:00am, an hour and 25 minutes after the pros. So by the time we got underway, the wind had started to pick up, which meant, with it being an ocean swim, it had started to get pretty choppy and rocky a half mile out to sea. The chop, along with the buoys drifting apart slightly, along with weaving in and out of slower age groupers made for a tough swim. Miraculously, I navigated the course pretty well (if I do say so myself) and exited in 26:57, which I thought was pretty good considering the lead pack of pros did it around 24 minutes in much more ideal conditions. I believe I was in 10th place at the time of my exit. I jumped on my bike and took off at an olympic distance pace, knowing that I needed to go hard and find some faster guys to pace and work with so I didn't get caught in a fat pack of 50 people sucking each others wheels. Somewhere around mile 4 I hit a pile of concrete and heard something "clink" under me. I looked down and sliding on the ground directly under my right foot was my aero water bottle filled with perpetuem.. my only nutrition for the day. Hmm, I could stop and loose time to pick it up or go on and pick up powerbar drinks at the aid stations. I decided to just keep going (probably because I felt good at the time) which would be a big mistake. I never found anyone to pace with the entire ride. I began to hate this bike course the longer I rode. I would just see massive pack upon massive pack flying in the opposite direction. Don't get me wrong, I'm not hypocritically claiming that I had a "clean" race by any means. I was in the slip stream of the slower riders I passed in front of me, but I never sat in a pack and got the benefit of a "draft"the entire time. Not to mention it was windy. It felt like a constant head wind for the first 25 miles and in various places on the back half of the course. I remember specifically, at mile 50 my legs started to really hurt. I hadn't had anything but water for the first 25 miles, then only powerbar drinks, passing by aid stations after that. So being a little under 3 hours into this race, I was already bonking. I got off my bike feeling encouraged though. I've been doing so much running lately, that I was sure I could overcome my nutrition deficit to finish this race in my goal time. I felt great for the first 3-4 miles, averaging low 6 minute miles. I purposefully held back a bit, knowing that this was not an olympic distance race (like my body had been use to in the past month), I'd have to pace myself correctly in order to conserve energy. I hit the 6 mile marker in 39 minute exactly. I started to slow after I went up and over the bridge again, the legs were starting to feel heavy. It must have been funny for my family to watch this next portion of the race unfold. They were standing about a quarter of a mile away from the turnaround of the second lap. So they saw me go by feeling pretty good, running around a mid 6 minute mile. Then as soon as I hit the turn around, I lost my momentum and rhythm and went into survival mode. As I ran past my family, literally just 3-4 minutes later, I was a completely different person. I looked like I was about to fall over. All I could think about was how hungry I was. My stomach was eating itself and my muscles were on fire. I ran past someone cooking cheeseburgers and I would've paid $100 to have just a bite of one. I staggered thru an aid station and grabbed a handful of pretzels. The second they entered my mouth, it dried up like a desert. Coke, and more coke was all I drank for the remainder of the race. It was the only thing that I wanted... sugar, carbonation and calories, and immediately. I ran miles 7-10 at a snail's pace. People were trying to encourage me but nothing was working. I was out of energy. It sucked because my heart rate probably wasn't even above 120. My muscles were just so exhausted. I didn't even feel like I was working aerobically, I was watching the ground moving slowly under me, thinking to myself "dang I'm really going slow.. my mom could probably outrun me right now". After I crossed up and over the bridge for a 3rd time, I dove into the coke at an aid station. Three cups. About a minute later, it was like my legs turned on. I could move them again. I started to cautiously pick up the pace and stretch out my strides. After crossing the last timing mat, I knew I only had three+ miles to go. Looked at my watch and said "I don't care how tired I am.. I have to break 1:30 today". Just like that, I started running low 6's again. Ran past 4 guys in my age group going up the bridge one last time and didn't look back going down it. I flew past one more guy in my age group in the last mile and knew I was home free. Just happy to be done with this race, I crossed the finish line with an underachieving 1:28 half marathon and 4:12 overall on the day. Ended the day in 14th place in my division and 110th overall. Compared to 19th in my division last year and 202 overall. I improved my time by 4 minutes on a tougher course, in tougher conditions, with no nutrition other thank coke and water. I know I could've run well under a 1:25 which makes me upset, but you learn from your mistakes. Am I happy with 14th place?... not at all. However, the positives of this race outweigh the negatives by a good amount. I've got to remember too that this isn't a local sprint tri, it's a world championship, so the level of competitiveness is much higher. It has been a good year, and the races that have been my "A" races, I've done well in. (California 70.3 3rd, Hawaii 70.3 2nd, Vineman 70.3 1st, Alcatraz 1st). So yet again, I just have more motivation to work harder this next year and keep improving. I'm going have my good friend, the speedy Mike Clinch, help coach and work with me this offseason to achieve some major improvements in my running, which is feeling stronger every day. I'd like to thank family, friends, and B+L bike and sport for all of your support.. my girlfriend Lindsey Addie for putting up with all of my training and ridiculousness, and Jesus for saving such an unworthy person. I couldn't be where I am with out you!!!! Well, it's been an interesting last month or so. Came out of my last 4 races feeling horrible. I've been sick ever since my race in Alabama and finally went to the doctor and got rid of it last week. I've managed to get in some decent training in the presence of me feeling like crap but it hasn't been too solid. Nonetheless, I'm feeling really strong going into this race. Mentally, I'm probably the strongest I've ever been right now. I want this race more than any other I've competed in. I experienced everything about this course last year and I know what to expect, it's just a matter of doing in on Saturday. Last weekend, I had a little moment of relief when I blew out of my "slow" running rut, that I've been in the last 4 months. I won the November SDTC triathlon with a nicely paced 21:56 4 mile run. Not only did I finally start running fast, but it was a pace that I felt I could sustain for much longer. It doesn't matter this week though, all that matters is what I do on race day. This is going to be a really competitive field like last year, where the winners of my division were running 1:15 and 1:16 half marathon splits. I definitely don't have that kind of capability right now but I know I can put up a strong run. I've never broken a 1:30 half (in a 70.3) before, so anything under that will be a success. I'm also feeling quite strong swimming as well. I've hit 26:00 on the dot three times this year in a 2k swim, but never gone under that. I feel like I can break it right now if we're given somewhat clean conditions. Who really knows what is going to happen in the bike. This bike course is flat and narrow and packs forming are unavoidable. So I could end up going 2:30 or 2:00.. you never know. My goal is to race to the capability to which I know I can. I don't expect to be throwing down 5:45 miles but I know I can run a lot faster than 1:30. My body may be lagging a bit from being sick right now but mentally I'm way fired up. I just pray that God gives my body the strength to do what I know I can do.